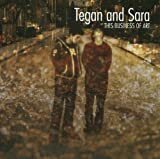 Tegan and Sara's, "The Con"
I'm coming around, coming around. But nobody likes to but I really like to cry. Nobody likes me maybe if I cry. Sounds like someone needs Prozac if they feel alone in this world.